1 of 4 Heat oven to 450 degrees F. Rub roast with 1 tbsp of the oil and season with 1/4 tsp each of the salt and pepper. Place in a large flame-proof roasting pan. 2 of 4 Place potatoes and carrots in a large bowl and toss with 1/2 tsp of the salt and remaining 1/8 teaspoon pepper and 1 tbsp of oil. 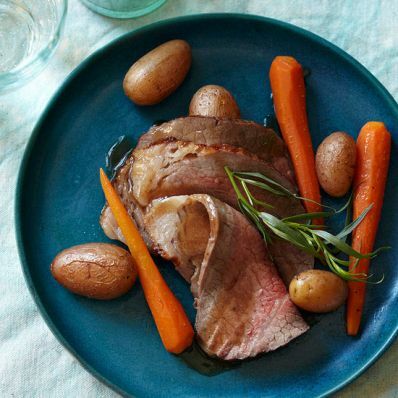 Arrange potatoes and carrots around meat and roast at 450 degrees F for 50 minutes or until internal temperature of meat registers 130 degrees F on an instant-read thermometer. Stir vegetables once after 25 minutes. 3 of 4 Remove roast and vegetables to a serving platter and cover for 10 minutes. Place roasting pan on stovetop over medium-high heat. Add wine and scrape up browned bits from bottom of pan. Combine broth and flour and stir into pan; add 1/4 tsp of the salt and simmer for 1 minute until thickened. Stir in tarragon and chervil. 4 of 4 Thinly slice meat and sprinkle with remaining 1/4 tsp salt. Serve with vegetables and herb gravy.